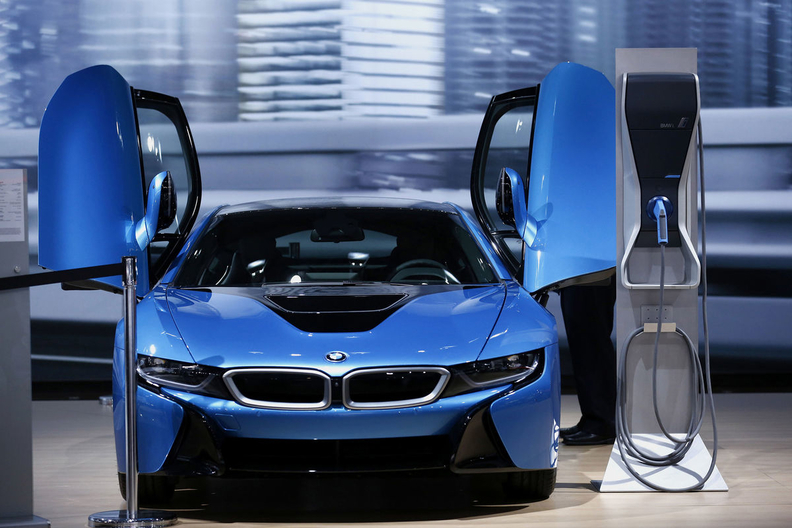 BMW will show its wireless battery technology in the i8 plug-in hybrid supercar at this week's International CES. LAS VEGAS (Bloomberg) -- BMW is trying to make charging cables optional as it plans plug-in hybrid versions of top models from the 3 series to the X5 SUV. BMW will show wireless charging technology in the i8 hybrid supercar at this week’s International CES in Las Vegas. Using a magnetic field to transmit electricity between a base pad on the garage floor or street and a coil on the underside of the vehicle, drivers would be able to avoid retrieving cables from the trunk and getting their hands dirty re-folding them. “Inductive charging offers important convenience benefits for drivers of electric or plug-in hybrid vehicles,” the luxury carmaker said. BMW and Mercedes-Benz owner Daimler agreed last July to work together on wireless charging. Under pressure to meet tough emissions regulations, both carmakers have promised to broaden their range of electric vehicles. Mercedes already offers the electric B class and a plug-in hybrid version of its top-of-the-line S class model. Today’s prototype takes two hours to replenish the battery of the i8, which can drive in electric-only mode for 23 miles (37km), about the same time as using a normal cable. BMW also sells the i3 battery-powered city car as part of the “i” subbrand it created to showcase its clean-car technology. BMW had already worked on contactless charging in a previous partnership with Siemens, testing prototypes in Berlin in 2011. Fulton Innovation, a unit of Alticor Inc., also showed the technology that year on Tesla’s Roadster electric model.